Muscat, the capital city of present day Oman, has had a long, and colorful history as a typical Indian Ocean port at the mouth of the Persian Gulf. International trade brought about a rich mix of various ethnic and religious groups including, besides Arabs, Africans, Baluchis, Mekranis, Sindis, Gujaratis, Persians and many others. At the turn of the twentieth century fourteen languages could be heard spoken in the city. As a result the people of Muscat tended to be more outward-looking, and tolerant of various cultures, than those of the hinterland. Nonetheless, the city remained a secondary port for most of its history. By 1750, due to anarchy in Iran and problems in Basra, Muscat became the most important Persian Gulf port, and very wealthy. This position was further enhanced by a strong Omani fleet built by the early Al Bu Sa`id rulers. By 1820, however, the Persian Gulf ports reasserted themselves and the Pax Britannica put an end to the use of Omani sea power, and Muscat started to decline. Sultan Sa`id II focused his energies on the development of Zanzibar on the African coast, but by 1868 revenues from Zanzibar and Bandar Abbas had all been lost. Furthermore, conflict between Muscat and the interior and the arrival of steam ships, which supplanted the smaller, local vessels, further sapped the city’s strength, and its prosperity. By 1900, Muscat had become a sleepy steamer port with a considerably reduced population. 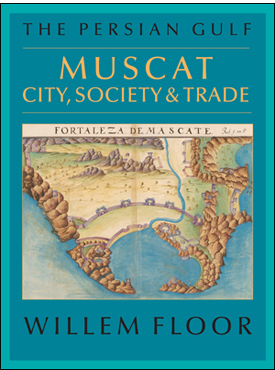 In Muscat: City, Society, & Trade, Willem Floor marshals a wealth of historical documents and challenges some of the heretofore accepted wisdom about the city. Those interested in the socio-economic and medical history of the Indian Ocean and the Persian Gulf will find here a rich banquet of information. Willem Floor studied development economics and non-western sociology, as well as Persian, Arabic and Islamology from 1963-67 at the University of Utrecht (the Netherlands). He received his doctoral degree from the University of Leiden in 1971. Since 1983, Dr. Floor has been employed by the World Bank as an energy specialist. Throughout this time, he has published extensively on the socio-economic history of Iran. His books include: Public Health in Qajar Iran, Agriculture in Qajar Iran, and The History of Theater in Iran, as well as, The Persian Gulf: A Political and Economic History of 5 Port Cities, 1500-1730, its second volume, Persian Gulf: The Rise of the Gulf Arabs, 1747-1792, third volume, The Rise and Fall of Bandar-e Lengeh, the fourth volume, Bandar Abbas: The Natural Gateway of Southeast Iran, and the fifth volume, The Persian Gulf: Links with the Hinterland Bushehr, Borazjan, Kazerun, Banu Ka’b, & Bandar Abbas. He has also published, Travels Through Northern Persia, 1770-1774, Titles and Emoluments in Safavid Iran, and A Social History of Sexual Relations in Iran; Labor and Industry in Iran, 1850-1941; Guilds, Merchants and Ulama in 19th Century Iran; The Rise and Fall of Nader Shah; Games Persians Play. His translations include: Samuel Gottlieb Gmelin’s Travels Through Northern Persia 1770–1774 , and with Hasan Javadi, Abbas Qoli Aqa Bakikhanov’s The Heavenly Rose-Garden: A History of Shirvan & Daghestan; Evliya Chelebi’s Travels in Iran and the Caucasus, 1647 and 1654; A Man of Two Worlds: Pedros Bedik in Iran, 1670–1675, The Persian Gulf: The Hula Arabs of The Shibkuh Coast of Iran, and The Persian Gulf: Dutch-Omani Relations A Commercial & Political History 1651-1806.